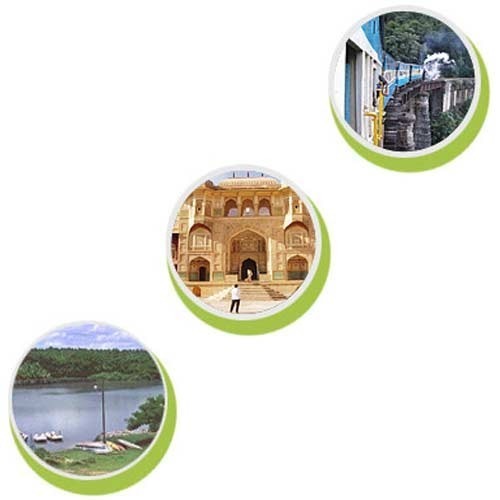 We are one of India's leading travel service providers of Getaway Packages, specialized in providing customized travel services to tourists visiting the Indian Sub-Continent. Kodaikanal is a place situated at 2100 meters above sea level, in the glorious Palani Hills. It is just 120 Kms far from the bustling city of Madurai. The orchards of pear trees and their graceful branches look amazing and easily attracts tourists towards them. There number of places to visit like lakes, Flora & Fauna Museum, Astrophysical Observatory, Bryant Park, Kurinji Andavar Temple, Water Falls, Coaker's Walk and Pillar Rocks. The beautiful place Ooty is situated amidst marvelous Nilgiri mountains of southern India. A huge number of tourists come here for adventure, celebrating honeymoon and the film industry. Besides this you can also enjoy some places like Mini Garden, Art Gallery, Rose Garden and Kotagiri. It is considered as one of the most beautiful places in South India. Munnar is one of the most glorious getaways landscaped with tea plantations, lakes, Hill Swami Bagh Samadhi s, forests and winding walks. This is situated at an altitude of 1,829 m, there is a highest peak there Anamudi, standing 2,695 m tall. It offers tourists a great blend of adventure and relaxation in between the beautiful landscapes. Calicut is located at the Arabian Coast, which has a huge and checkered history, as it was the capital of the powerful Zamorins. This city is famous for its beautiful countryside, wildlife sanctuaries, pristine beaches, calm backwaters, rivers, timber industry, historic sites and ayurvedic medicines. Kadavu is one of the most beautiful islands of Fiji and has many places for sightseeing. Jaipur is the largest city of Rajasthan, popularly known as Pink City. The presence of beautifully carved monuments, Temples and various other tourist places made it one of the best tourist spot. A large number of people from all over the world visit Jaipur to experience its diverse beauty. With such great scope, we have come up with an exclusive touring package, comprised of 2 nights and 3 days stay that gives you best value of your money. Agra is one of the most popular city, which has a number of tourist attraction including the famous Taj Mahal that simply showcases the true love of 'Shah Jahan and Mumtaj Mahal.' Moreover, Agra has Agra Fort, Fatehpur Sikri, Itimad-Ud-Daulah, Akbar's Tomb, Sikandra, Swami Bagh Samadhi and lots more. The tourists can enjoy the greatest attraction via such fabulous beautiful places and can even enjoy their stay of 2 nights 3 days with lots of fun and enjoyment along with recalling the epic era. Pondicherry is a city of beauty and alluring points, its beautification gives tourists an opportunity to experience French past. Pondicherry spread love all around and is surrounded by large bouquets of bougainvillea hanging on the colored walls of colonial mansion. We are offering our tourists best packages including 2 nights and 3 days stay to have unlimited fun without bothering about the prices.